A New York Times bestselling author and a rising-star illustrator present an utterly hilarious, oh-so-silly tale about Mr. Pockles, an odd little dog with a big hat collection--and an even bigger heart. 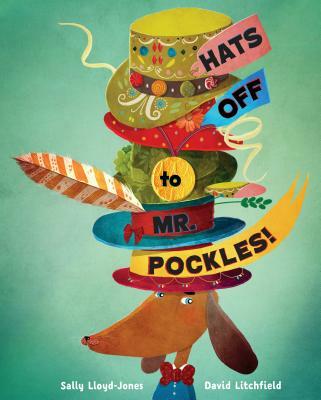 For Mr. Pockles, going without a hat is as unthinkable as going around without any pants on. He has millions of hats, for every occasion--an Eating His Cornflakes hat, a Drinking Cups of Tea hat, and even an In the Bath hat--but for some reason, he doesn't have any friends. One day, when Lady CoCo Fitz-Tulip--a Very Important Panda--finds that her hat has been gobbled up by some hungry bunnies, Mr. Pockles knows just how to help. Overflowing with silliness, here's a charming celebration of friendship, inclusion, and the joy of sharing. SALLY LLOYD-JONES is the author of the New York Times bestseller How to Be a Baby . . . by Me, the Big Sister and its companions, How to Get Married . . . by Me, the Bride and How to Get a Job . . . by Me, the Boss. She has written many other books for children, including Poor Doreen, The House That's Your Home, and, most recently, Goldfish on Vacation. She spent her childhood in Africa and England and now lives in New York City. Visit her at sallylloyd-jones.com, and follow @sallylloydjones on Twitter. DAVID LITCHFIELD is the author and illustrator of several books for children, including the bestselling The Bear and the Piano, winner of the Waterstones Children's Book Prize; The Building Boy by Ross Montgomery; and, most recently, Grandad's Secret Giant. David lives with his family in Bedford, England. Visit him at davidlitchfieldillustration.com or follow him on Twitter @dc_litchfield.